Save by enrolling in our entire program rather than purchasing each course individually. 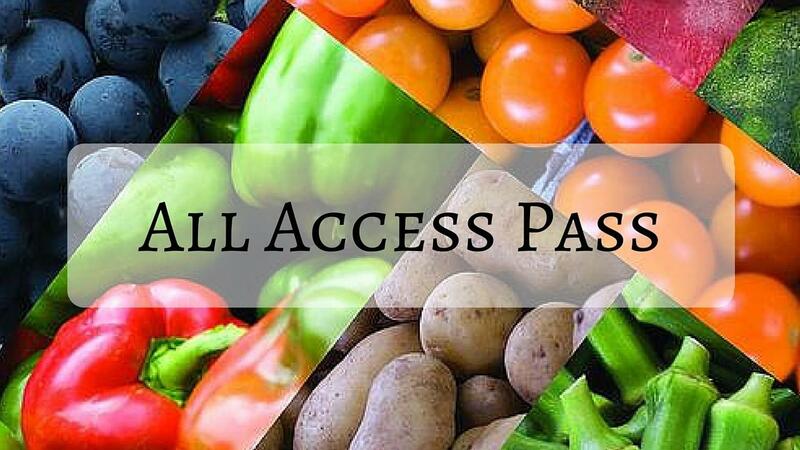 All Access Pass gives you immediate and unlimited access to each course in both the Living Foods Academy Series AND the Preserving the Harvest Academy Series. The Living Foods Academy includes or will soon be released courses on Kombucha, Microgreens/Sprouts, Kefir, Cultured Vegetables, Bone Broths, Grains, Legumes, Sourdough, Nuts, Intro to Herbs, Sea Vegetables, Healthy Kids Lunches, and Cleaning without Chemicals. WARNING: Clean eating according to God's design through Living Foods will result in more energy, better sleep, more vitality, better overall health, and better balance. Contrary to common belief, eating healthy isn't bland or boring, doesn't have to cost an arm and a leg, doesn't require a culinary degree, and can be fast, easy, and enjoyable for the whole family. The Preserving the Harvest Academy includes or will soon release courses on Water Bath Canning, Pressure Canning, Freezing, Dehydrating, Freeze Drying, Lacto-fermentation, Pickling, Jams & Jellies, Vinegars, Infusions, & Extracts, and Root Cellaring. Break out of the cultural norms to a more simple approach and take your health back. We welcome you to join us on this journey. Limited Offer! Save even more by enrolling in our monthly All Access Membership. Rather than purchase each course individually, get access to the whole program for about half of the cost of one single course! All Access Members also get special Bonus content each month, access to our exclusive All Access LIVE webinars, and special discounts through some of our affiliate partners. Experience the health benefits of living foods and join the All Access Community! All Access Memberships are only available for a short time, so get in while you still can! Are you serious about learning simple and effective ways to live healthier through living foods? Do you want to preserve your harvest so you know that your family is getting nutritious, organic foods from your garden or local farmers market? For a limited time, you can now get access to our entire Academy for one low annual price! With a content value of over $1900, enjoy watching as many of our tutorials as you want, as many times as you want, at the time that is most convenient for you!